By now you should have two tabs open. You'll watch videos in this tab, and the starter project should be open in the other one. If you do not have another tab with a starter project, return to the last video, and follow the steps described. In this video, you will set up the starter of your story. You will select two characters and a setting. Then you will write dialogue to foreshadow the glitch. In story telling, foreshadowing is a way to give hints to the audience about something that will happen later in the story. In this example, the audience gets a hint that something strange is about to occur, when the character says "you won't believe "what's happening." To start, select a main and a supporting character. In Scratch all characters and objects are called sprites. You will use code blogs to control the sprites. Right now all the characters are hidden. To select the sprites for your story, program them to show. Click a sprite you'll like to use for your main character. Then click the purple Looks menu. Blocks in Scratch are color coded, to find a purple block, look in the purple menu. Click and drag in show block into the script editor. Click the block to run it. The sprite should appear, if you click the block again nothing happens, that's because the sprite is already showing. If you change your mind and want to select a different main character, click hide, and choose a new sprite. Once you've shown the main character, select and show a sprite to use as a secondary character. Your main character will foreshadow the glitch during a conversation with this character. Next choose a setting for your story. Click the stage, then click the Backdrops tab to see the preloaded backdrops for this project. A story setting influences how its' told. For example, characters might behave differently on the playground than they would in the library. Click a backdrop to select it. At this point you should have three things, a main character, a secondary character, and a setting. Next create dialogue that foreshadows the glitch. Select the main character and Codes tab. To make your characters easier to find, drag them to the top of your sprite list. This does not affect how your program runs but it makes it easier for you to write the code. To make your main character say something, use a say for two seconds block, click and drag it below the show block. Click the blocks dot to run it. Great, the main character says "hello". To change what the character says, click inside the say block and type some text. To add more dialogue add more say for two seconds blocks. Create dialogue that fits your characters and the story you will tell. The later videos you will add a glitch. So what your characters say should foreshadow or hint that something is wrong. The lines you see here are just examples. Write your own dialogue for your story. To try your code click to run it. The computer will run the code in the order or sequence that you create. 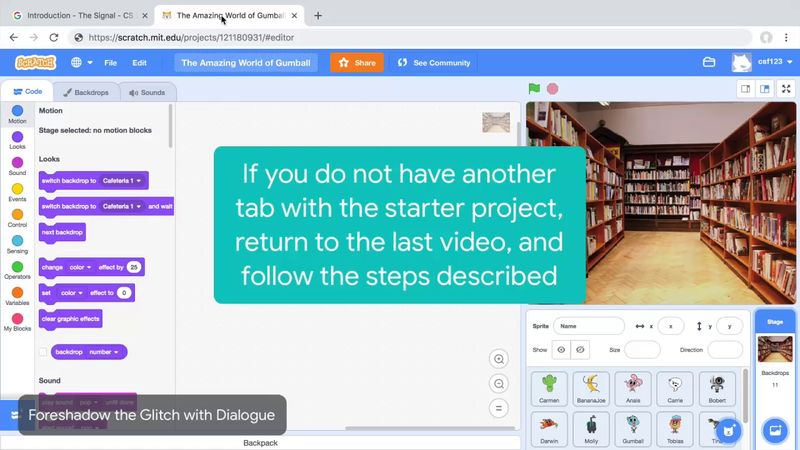 Once you bring dialogue that foreshadows the glitch, click the Share button so your friends and family can view your awesome project. Then move on to the next video to write the code for the glitch. Now it's your turn, select a main character sprite and show it, select a secondary character and show it. Select a backdrop and use say for two seconds blocks to foreshadow the glitch in your story. Then share your project and move on to the next video. Select a main character sprite and show it. Select a secondary character and show it. Use "say for 2 seconds" blocks to foreshadow the glitch in your story.